Even though I wanted to stay in Mexico City longer, I knew I would return – I know I will return. And anyway, I had exciting things to look forward to: my friend Renee and her Australian boyfriend, Ben, and I were taking a road trip. A road trip all the way into the Mexican jungle: our final destination together, Palenque, in the state of Chiapas. 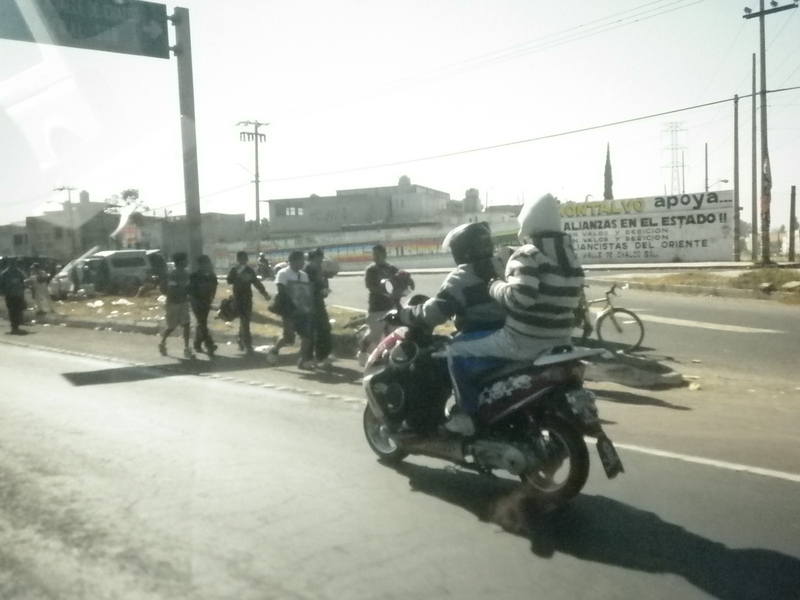 It’s strange leaving Mexico City in a car. Well, driving anywhere in Mexico is an adventure in itself, but because Mexico City is so elevated, you hit mountains early on and spend a great deal of time climbing down them. 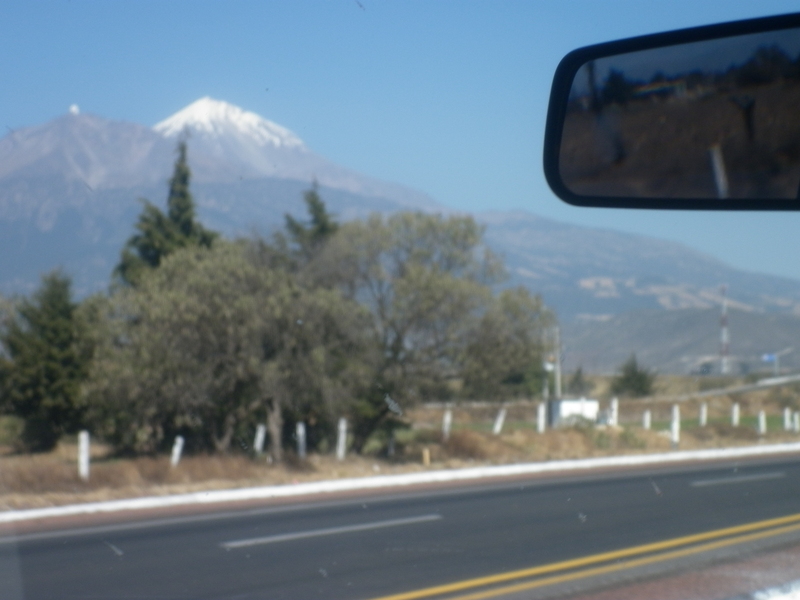 We headed east into the state of Puebla, passing Mexico’s tallest peak, Pico de Orizaba, and hundreds of pilgrims heading to Mexico City for the Virgin of Guadalupe’s birthday celebrations. Or, if they weren’t heading to the Capital, they were heading to the nearest town from their village. The rocky, dusty mountain route wound its way around valleys and through tunnels, and before we knew it, we had hit subtropical climes, palm trees sprung out of the ground next to vast wetlands, we took our jackets off – we were now in the state of Veracruz, along the Gulf of Mexico. We decided our destination for the night would be the small port city of Coatzalcoalcos (I spent the day trying to pronounce it correctly). 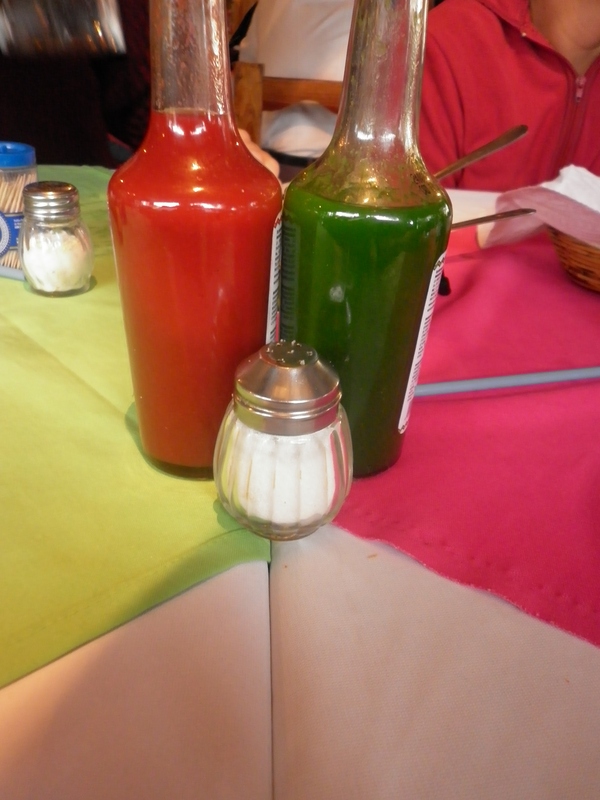 We booked into a hotel after a delicious seafood meal with which I tried habanero chili sauce for the first time. I enjoyed the taste, but it did invite involuntary tears to come spurting forth. We then explored the town centre where the festivities for the Virgin’s birthday had already begun. 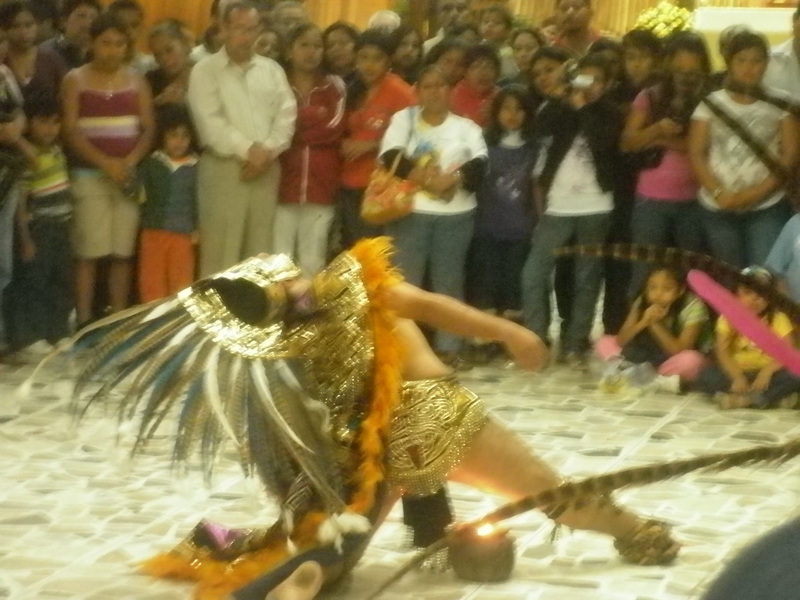 We watched a group of indigenous dancers perform and then, strangely enough, make an offering in the church. It was strange, but an excellent example of Mexico’s pre-Hispanic and Catholic mix: the Virgin once being a mother-goddess for the ancient people of the land, and also a beloved mother figure from the Old Testament introduced by the Spanish during the conquests. Outside the church fireworks were being lit, and like the chilies, they brought tears to the eyes as they exploded right above our heads (obviously not confined by strict OH&S or fire ban laws like in Australia). After a walk along the esplanade, watching Coatzacoalcos teenagers get ready for a big night out, we decided to turn in and get a good night’s sleep for the final leg of the drive. 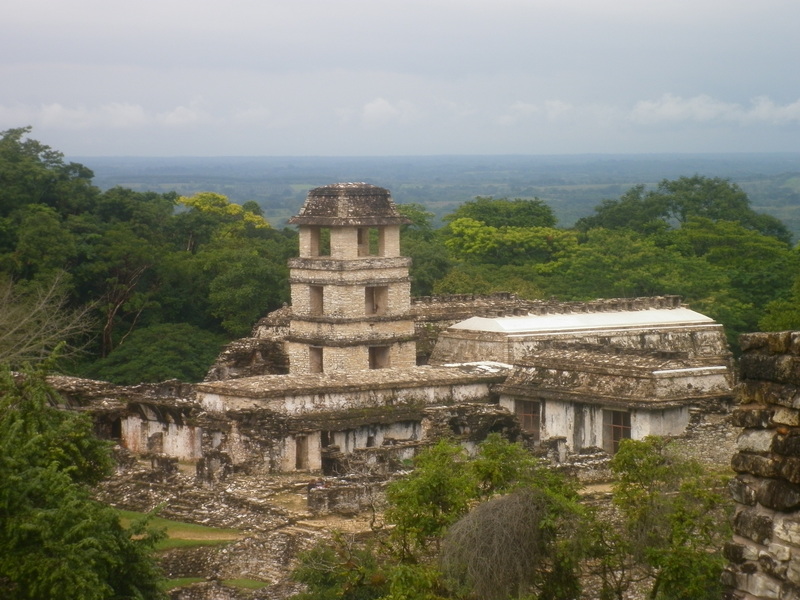 Palenque is an archaeological site in the middle of the Chiapas jungle at the base of the Yucatan peninsula, close to the border with Guatemala. 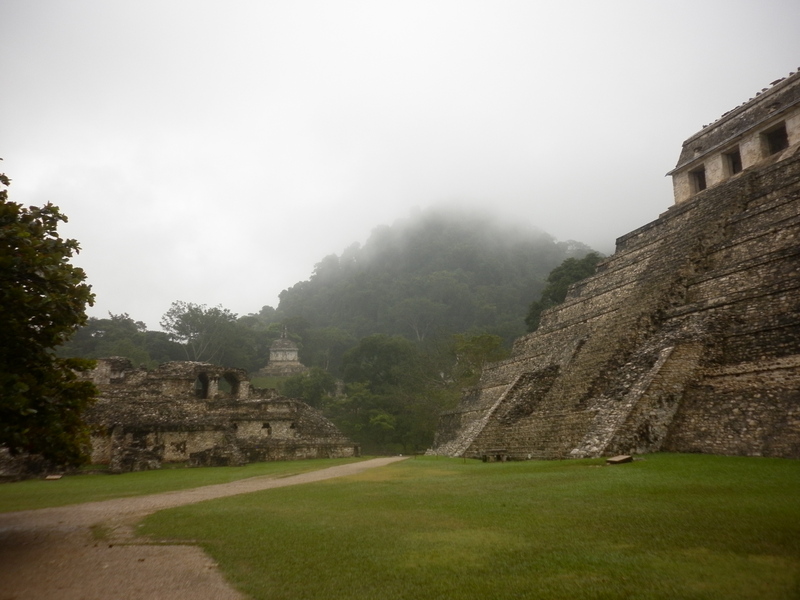 It was a Mayan city state that had its zenith in the 7th century and fell around 800AD. It’s smaller than other archaeological sites on the Yucatan peninsula, like Calakmul, and not as famous as Chichen Itza, but Renee guaranteed it was the most impressive, with the best examples of Mayan produced sculpture and carving. She wasn’t wrong: the architecture of the palace and pyramids in the surrounding jungle-scape gave the site a great Indiana Jones feel. 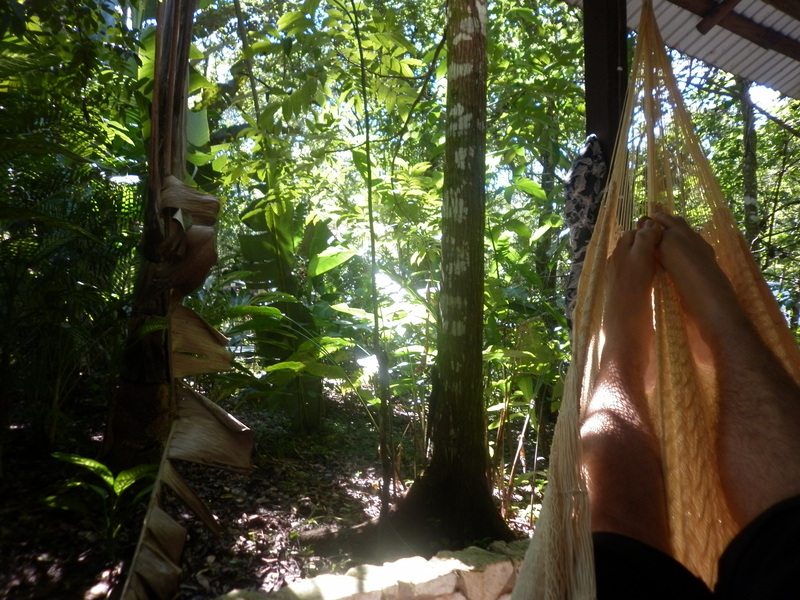 We stayed in cabins in a jungle resort for those wanting to get close to nature. Unfortunately this meant the place was riddled with gringo hippies. Or they were the type of tourist who thought that not washing and taking ‘green’ drugs meant they were actively being a “traveller”. Or, they were Argentinean, and played the bongos. I had a cabin to myself. It contained a queen size bed and a single bed and a bathroom. I put my suitcase and other belongings on the single bed and used the queen to sleep on. Both beds kind of looked like they were drifting in the middle of the room. They weren’t pushed up against the wall, and from the stains scattered here and there on the walls, I assume this meant it saved you waking up to find a tropical multi-legged friend staring back at you. I like the tropics. I like the vivid green and the humidity. I like hearing the animals make sounds that are as dense as the air trapped under the canopies. What I don’t like are spiders. Or mosquitoes – and I’d forgotten all about getting shots or malaria tablets before coming to Mexico, so the first thing we did was buy insect repellent (contra Dengue!) in Palenque town. This, however, didn’t make me forget about constant bug vigilance. It was with this anxiety I went to bed the first night. A jaguar was growling outside my cabin when I awoke during the night. It was a constant sound, like domestic cats in heat, groaning at the moon. It was terrifying. I peaked outside my window, my ceiling fan swooping silently overhead. I couldn’t see anything except the dark outline of foliage in the near distance. The jungle was alive. Underneath the growling was the rhythmic chirping of bugs and birds. Then I realised, it wasn’t a jaguar at all. That was stupid. It was just the howler monkeys anticipating a change in the atmosphere. Soon enough, big drops of rain started to fall and hit the tin roof of the cabin, creating a new layer to the cacophony outside. I noticed my ears burning. It felt like something had bitten them. Images of me remaining in bed for months in agonising pain, malnourished from some tropical disease flashed through my mind. The next day in Palenque we met up with Renee’s friends James and Rocio who were on their own adventure through southern Mexico. For the next two days we visited several sites around the area together, including the Mayan ruins and some waterfalls. We found a local restaurant off the tourist map, and I continued my new found love of habanero chili, drizzling it on my tortillas at every opportunity. That night I woke up with a Mayan priest standing over me, raising his hands to the heavens, muttering some sort of sacrificial chant. He looked down and in his eyes I saw red smoke, and then my insides churned. My body lurched, and I doubled over in bed, contracting from foetal to plank and back again. My stomach in a death grip, the priest tore open the roof and let the spirits fly into my gaping mouth. I wondered if I was finally succumbing to some sort of Montezuma’s Revenge and plotted the quickest path to the bathroom – reminding myself it was the toilet, not the sink, that one b-lines to (I’ve made that mistake before – this is how seldom I vomit). I focussed on my breathing and listened to the jungle heaving outside. My gut was accommodating the introduction of habanero. Lucky for me, all I suffered was the sweats, and eventually fell asleep again. Soon I was standing in the bedroom I had when I was a teenager. Everything seemed the same as it was then: even how I felt about myself. I was on the phone to a friend. They said they couldn’t meet me, and that they’d moved on from our friendship. It happened with everyone I called, every time I said, “I’m back! Let’s meet up – I can’t wait to see you!” No one had any time for me. My parents weren’t even happy to have me home. And when I tried to remember where I’d been, my mind drew a complete blank. I lost all confidence. I went back to night-filling at Big W.
Every night in the jungle I had nightmares, experienced discomfort, or wallowed in general anxiety. I saw the last leg of my trip rise up over the Gulf of Mexico with the sunrise and it scared me. For the first time on the entire trip, I was waking up not knowing where I was. But no matter what had happened during the night, I got out of bed feeling OK. I like to think it was a Mayan cleanse of sorts. In the night I was sacrificing old habits and ways of thinking by facing them head on. A friend who’s into dreams once told me that if you don’t remember your dreams, you’re not ready to deal with the issues your subconscious brings up. I remembered every detail of mine as I awoke [what I’ve described here is not exactly what I dreamt – for privacy’s sake], and without much effort I could throw them into the surrounding undergrowth, rolling my eyes, and seeing them for the nasty, mythological serpents they really were. Unfortunately, I also woke up to the hippies practicing bongo-drumming. But I found some consolation in the fact that putting up with the sound of this meandering percussion was going to be the worst nightmare of all.